These days we know exactly how hackers and digital spies take advantage of our data. Despite this knowledge, we still neglect to take the necessary measures to keep them at bay and avoid having our most personal information revealed. Here are four easy changes you can make right now to get an instant security boost. Sometimes the simplest actions can make the biggest differences. Today, most devices come standard with at least one camera and microphone. These inputs can be hacked, enabling the perpetrator to see and hear exactly what you are doing and saying without even alerting you to his presence. Although you’d be hard-pressed to find a device today that doesn’t include these features, there is a quick fix to this serious security problem: just cover them up. In June 2016, Mark Zuckerberg made the news for sharing a photo on his Facebook account. 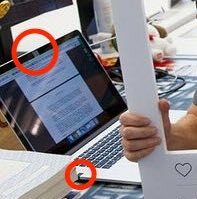 He didn’t share anything scandalous, but eagle-eyed viewers noticed that he had his webcam covered with a piece of tape. Although he wasn’t the first to think of this solution, the mere fact that a person as savvy and powerful as Zuckerberg would bother taking that action is enough to tell you everything you need to know about how susceptible we are to this kind of security breach. There are certain apps that you want using the GPS antenna in your device. These may include mapping apps and services that help locate your missing device. Applications that are basic utilities and don’t directly use your location information, do not need to access your GPS antenna. Despite this, everyday users grant basic apps permissions to programs to access that very thing. This enables them to know where you are and to create records about your habits. To prevent this, make sure to review the permissions you grant to your most used apps. It is a good idea to disable location services for specific apps, and on your device completely if you are not in need of it. Many of the services you use every day collect your information regularly. Even the biggest consumer software companies like Google, Microsoft, and Apple are guilty of collecting information, even if you never opted in. The easiest way to opt out of this unchecked data collection is to do so from the moment you sign up for or install software. Even if a company promises to keep your data anonymous, there is no reason to do them the favor of providing valuable user information for free. It is likely that you already use a lot of different software programs and OS platforms, so it might be a good idea to search for methods of opting out of the data harvesting that each one is no doubt doing. Someone who browses the internet without a VPN is like a knight going into battle without his armor. Everything you do online can be viewed and tracked not only by hackers but by your internet service provider — the very people you put your trust into! That is why it is crucial to set up a virtual private network. A VPN reroutes all of the data you send and receive through encrypted servers, thus hiding all of that information from prying eyes. It can also spoof your location, enabling you to access sites and services without worrying about the limitations and borders of your physical location. You can even use a VPN to allay the ever-increasing fears of government snooping. As effective as everything on this list is, none is more effective than a good VPN. We hope that these tips help to set your mind at ease. The best way to beat the digital spies is to always stay one step ahead of them. Technology should provide greater freedom, not paranoia.